Hundreds of people receive expert medical care at Munson Medical Center every day. Sometimes they arrive during a life-or-death medical emergency. Sometimes their stay is planned. For all patients, it’s a deeply personal experience and one they will always remember. We understand how stressful it can be to need hospital care. That’s why we make every effort to provide the kind of high quality care we would want for ourselves or our loved ones. We could tell you more, but no one explains who we are and what we do better than our patients. Please listen to their stories. Tony spent a total of 100 days in the hospital and still gave his care a '10'. Read about Tony's amazing care and the credit he gives to his entire health care team. Absolute joy at the birth of beautiful twin daughters turned to disbelief and despair when one baby began to struggle. Hear about the loving, expert care delivered in Munson Medical Center's Neonatal Intensive Care Unit. What would you do if you passed out in the middle of your grocery store’s produce section? It happened to Marion. Hear how a Munson Medical Center neurosurgeon fixed her problem. A summer evening’s walk took a terrifying turn when this mother and daughter were both hit by vehicles. Hear about care in Munson Medical Center’s Level II Trauma Center. Jerry was shocked to learn he might need a heart transplant to stay alive. Then a Munson Medical Center cardiologist intervened with medication therapy. Learn how the Heart Failure Clinic saved Jerry’s life. World traveler Kate was confined to her couch with a devastating heart condition until a Munson Medical Center cardiologist introduced her to new technology that changed everything. Watch Kate’s story to see how she got her life back. 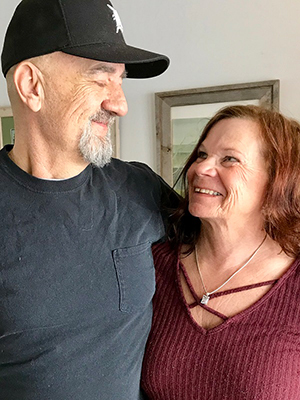 When treatment for COPD revealed a heart problem, cooperation between Otsego Memorial Hospital and Munson Medical Center cardiologists who travel to hold clinics throughout northern Michigan gave Jennie new hope. Robert returns to Munson Medical Center to say thank you to Munson Medical Center's inpatient rehabilitation team following his recovery from surgery to remove a tumor in his spine. Many patients write or call to thank us for the great care they received while they were in the hospital. They often mention the kindness of the physicians, nurses, and other staff members who made their hospital experience more comfortable, safe, and pleasant. We enjoy hearing from people who want to tell us their story. If you have an experience you’d like to share, please click here. We look forward to hearing from you.